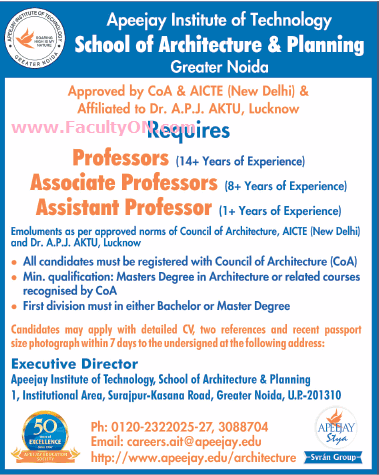 Apeejay Institute of Technology, Greater Noida has advertised in THE TIMES OF INDIA newspaper for recruitment of Teaching Faculty - Professors / Associate Professor / Assistant Professor jobs vacancies. Interested and eligible job aspirants are requested to apply within 07 days from 01st August 2018. Check out further more details below. About College: The School of Architecture & Planning is committed to impart comprehensive knowledge and training to create a pool of Architects geared to meet the challenges of buildings/habitat posed by the new millennium. The School was formerly inaugurated in October 1999 to coincide with initiation of classes for B.Arch 1 st year under the aegis of Dr. B.R. Ambedkar University, Agra . Starting with academic session 2000-2001, the B.Arch. Course has been affiliated to the U.P. Technical University, Lucknow. How to Apply: Interested and eligible candidates are requested to send CV, copies of certificates / testimonials, references and recent PP size photos to the postal address provided here.